For the last five years, artist Zena el Khalil has traveled to historic sites in Lebanon that have borne witness to violence to try to understand the wars that wracked her country for more than 25 years. At these sites of environmental disaster, massacre, and torture—including the former Khiam Prison and her own family’s home in Hasbaya, occupied by the Israeli army for more than 20 years as a military detention center (read: “A TED Fellow makes are from the rubble of her homes lost to war”)—she performs ceremonies of healing, creates artworks using materials found on site, and leaves behind symbolic messages of hope in the form of marks on buildings as well as painted objects left embedded in the rubble. Now she’s gathering the fruits of these explorations in an installation in Beit Beirut, the city’s most iconic war-torn building. With Sacred Catastrophe: Healing Lebanon, which opened one week ago, she’s created a platform for the city’s citizens to reflect, find reconciliation and start promoting dialogue about how society can recover. We asked el Khalil to tell us more about how Healing Lebanon came about, and what she hopes people will take away from it. Zena el Khalil stages Healing Lebanon in historic building Beit Beirut, in Beirut, Lebanon. Tell us about Beit Beirut. Why did you choose this building to house Sacred Catastrophe? This is the first time Beit Beirut is open to the public for such an extended period of time. The apartments in this building used to be private homes before they were taken over by militias during the Lebanese civil war due to its strategic location. The building is located on the former demarcation line that once split Beirut into two parts: one side being predominantly Christian, the other Muslim. Because it is on a corner, it had a wide range for offense: you can still see the bullet holes, sandbag barricades and concrete bunkers from which snipers used to shoot. The building literally became a killing machine, and hundreds, if not thousands, of people were shot at from this space, turning this location into one of the most dangerous parts of our city. After the war ended, architect and activist Mona El Hallak fought to preserve this building as the rest of the city was being rebuilt. 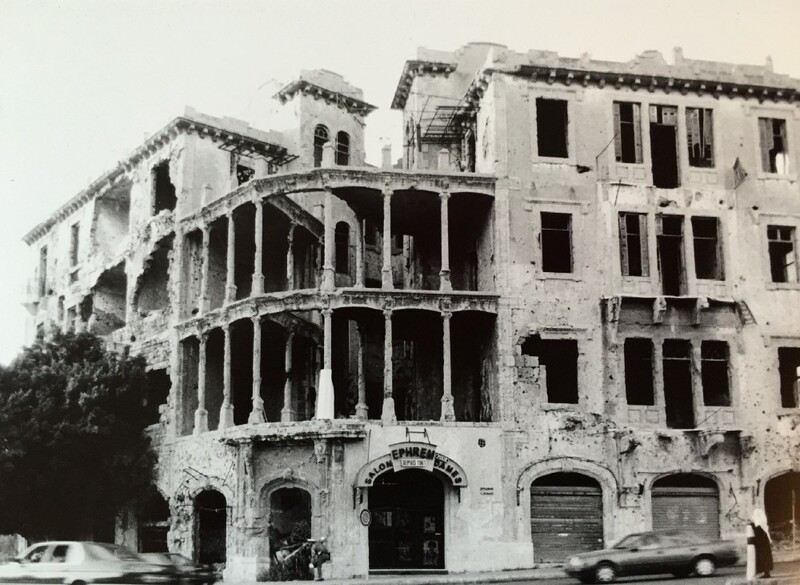 Eventually she convinced the municipality to expropriate it from the Barakat family, the original owners, for the public interest, to turn the building into a museum for the memory of the city of Beirut. She believes that this building itself is the closest thing Lebanon has to a public war memorial. The building’s renovations were finished last year, but it has yet to be officially opened as a museum as the Beirut municipality are still finalizing the legal framework of the space. Meanwhile, I was able to convince the city to let me use it, on the condition that I am responsible for everything during my intervention. The building was built in two stages, the first in 1924 in a rare and early manifestation of Art Deco infused in Ottoman style architecture. It’s a grand and gorgeous building — possibly the most beautiful building in Beirut. It has arches, pillars and windows that open out to the city. Despite the destruction, it still retains a kind of dark and haunting beauty. However, even after the renovation, the infrastructure is still rudimentary — there’s presently no functioning air conditioning or water, for example. But we have world-class art. Zena el Khalil visits sites formerly affected by conflict to create works of art from inks made from the ashes of what’s left behind. The exhibition shows paintings as well as sound pieces created on sites in Lebanon affected by war. What exactly do you do when you visit these sites? I have always been fascinated by derelict spaces. What happens inside abandoned homes that were once witness to everyday life? To births, deaths, cooking, arguing and even love making? I do healing ceremonies in these sites—which involves a process of chanting, meditation and connecting with the land and space, while focusing on understanding the historical realities of what happened. In a small fire ceremony, I burn things from the area, and from the ash of that fire I create ink, with which I paint on site. To close the ceremony, I do whirling, and I leave a mantra that I’ve painted — a word like “forgiveness,” “love”, “compassion” or “peace” in Arabic — sometimes on the site itself, and sometimes on a piece of cloth that I then roll up and hide somewhere on site, under a tree or a rock. The painting that I do onsite is a dialogue with both the space and the void. el Khalil’s site specific paintings at the Grand Hotel Sawfar, Lebanon. 2015. Why do you leave a piece behind as well as taking the painting with you? The idea is to stay connected to the site even after I leave, so that when I meditate on these words through thought, intention, drawing or even sculpting these words, I’m continuously sending love, compassion, forgiveness and peace to those places. I’ve left these symbols in many, many places, not just where I paint, but also all around the country. As of a year ago, I started giving mantras painted on cloth out to people, so that they too can take them all around the world. This will be part of an international mantra peace project I plan to launch next year. For this exhibition I’ve produced 5,000 of these mantra scrolls and have set up a community corner within the building for people to paint them, taking one for themselves and leaving one with me for the future project. The mantras are in Arabic with the intention to reclaim our language as a global ambassador of peace, love and tolerance.